For the first time in as long as I can remember, I missed the actual opening morning of muzzle loader season. My son Hunter (that's him above) had an away football game on Friday night. Neither of us was looking forward to heading out on only a couple hours sleep, so we reluctantly bagged the Saturday morning hunt. Mid-day Saturday, I headed out to do some scouting for our day-late opening day. I hadn't been at it for long before I walked up on a pretty nice eight pointer who crossed the logging road about 40 yards in front of me and never even noticed I was there. He had his nose to the ground and was moving along at a determined pace. "That's a good sign," I thought. Only one thing that gets a nice buck like that to let his guard down. The rut! I made a mental note of where he had crossed and backed out. It was an area where two secondary ridges meet at a high point on the main ridge. 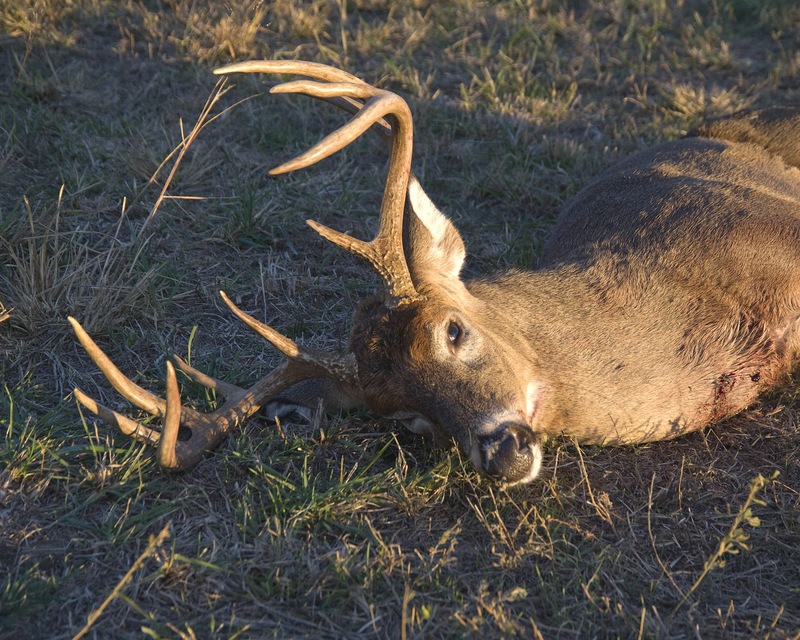 I've noticed a smattering of buck sign there over the past couple weeks, but never could find anything like a dominant tree or a funnel that would give me a high probability shot with a bow. Now that we could reach out a little further with a muzzle loader and with an actual buck sighting, it was looking much better. I checked some other spots that have had a good amount of deer sign for a couple weeks, but that I hadn't hunted for the same reason as the place where I had seen the buck earlier. I eventually got to a spot that I've had a gut feeling about for a while now. 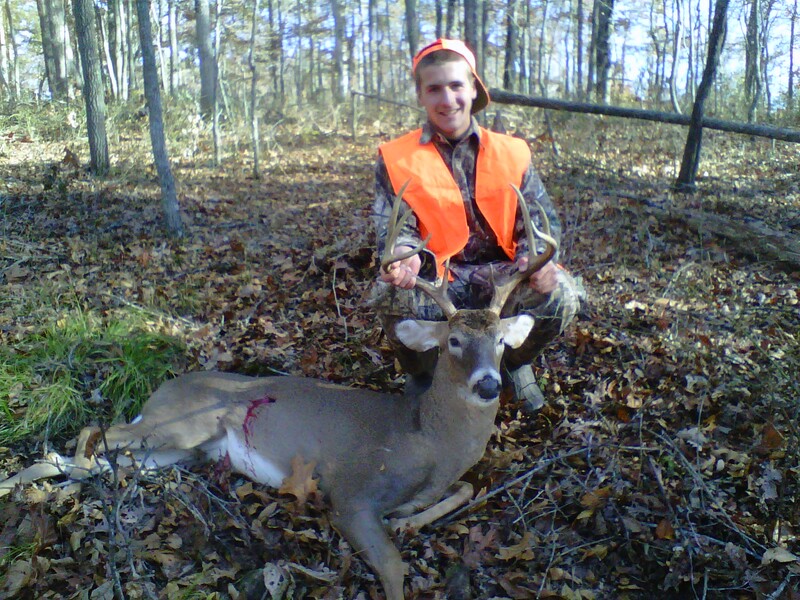 It was a saddle that I bow hunted early in the season. I had seen several does but no bucks that morning and just never went back. As I approached the saddle I stopped and immediately noticed a tremendous amount of walk sign. The newly-fallen leaves were already crunched up and broken. Several trails were bare dirt despite the fresh layer of leaves. It was obvious that lots of deer were in the area. As I explored further, I discovered a couple fresh scrapes and rubs. Then I noticed a cluster of red oaks in the middle of the saddle. I had just walked under them and found fresh droppings when I heard movement down in the nearby hollow. I looked toward the source of the noise and saw a really nice set of antlers sticking up over some thick brush. I threw up my muzzle loader and tried to find a clear shot but couldn't ever see anything that I was comfortable with. Eventually, the buck turned and walked downhill without offering a clear shot. To say that I was excited was a huge understatement. A natural funnel with lots of walk sign, fresh buck sign, a cluster of dominant trees, and now a shooter buck sighted just 75 yards away. It just doesn't get better than that! Hunter had a commitment that night so I picked out a tree on the downwind side of the saddle and settled in. 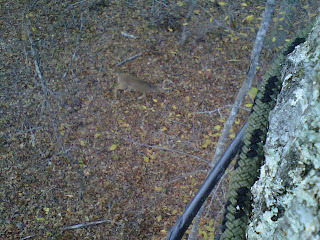 A couple does and this little nine pointer that I shot with my cell phone came through. On the fourth photo, I accidentally pushed the voice-dialing button on my phone instead of the camera button. "PLEASE SAY THE COMMAND" the female voice demanded. That little buck nearly jumped out of his skin and I just cracked up. At dark, I climbed down and marked my way out with bright-eyes so that I could find the same tree in the morning. Sunday morning Hunter and I returned to the same tree. He was the designated shooter and I was videographer. Wow! what a morning. It was truly a once in a lifetime hunt. The fact that I got to share it with my son and that I captured it on video made it that much more special. The only low point of the day (other than watching a nice ten pointer walk away) came when Hunter accidentally filleted the side of his finger while field dressing his deer. Luckily I had my first aid kit with me and got the bleeding stopped, but it eventually took six stitches to close up. It was a good reminder that sharp knives and adrenaline can be a hazardous combination and that a properly stocked first aid kit is a hunting necessity. I like to name my hunting spots. Since this one hadn't been named yet, it became Badfinger Saddle. The two bucks became, obviously, the Badfinger Bucks. A long day of meetings on Monday kept me out of the woods, but Tuesday morning I was back in the same tree again. 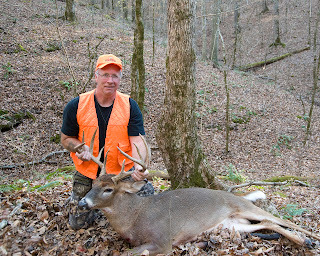 I was determined to get another crack at the ten pointer that had eluded us twice on Sunday. I saw far fewer deer than on Sunday, but a couple eight pointers that were a little smaller than Hunter's deer came through. Eventually the direct sun shining on enough layers of clothing to keep me warm at 32 degrees heated me up to the point that I was driven down the tree to shed some clothes and cool off. I decided that I was going to have to change tactics to kill that deer so I set off scouting/still hunting. I had been at it for a couple hours when I heard deer running down in a deep hollow off to my left. I hadn't seen any white flags and the wind was blowing from them toward me so I knew they hadn't smelled me. I looked around and noticed that I was in another saddle. "They're going to come right through here," I thought. I quickly picked out a nearby tree and sat down on the ground next to it facing the hollow. In about five minutes, my stomach began to grumble and my mind began to wander toward getting up to go for some lunch. Just then, a doe came barreling up the hill straight at me! When she was about twenty feet away, she finally saw me, slammed on the brakes, and took a hard left. Forty yards behind her was another deer that stopped as soon as she veered off. I threw my muzzle loader up and only had time to make out that it was a mature buck from the shape of its head. In an instant, he began to make that little lean that can only mean he's about to get gone quick. He was facing straight at me so I put the crosshairs on the center of his chest and squeezed. The first good look I got at him was as he ran off. I could tell he had good width and I could tell that he had been hit, but he disappeared back down in the hollow in about two seconds so I was left wondering if he might have been the ten pointer from Sunday and whether the shot I had made would put him down quickly and with a good blood trail. I've shot two other bucks in the throat with a muzzle loader, including this one captured on video on opening day two years ago. Both of them dropped like a sack of potatoes, so I was a little worried that this one hadn't. I decided to give him some time to bleed out if necessary, go get some lunch, and call some friends to help me do the tracking. 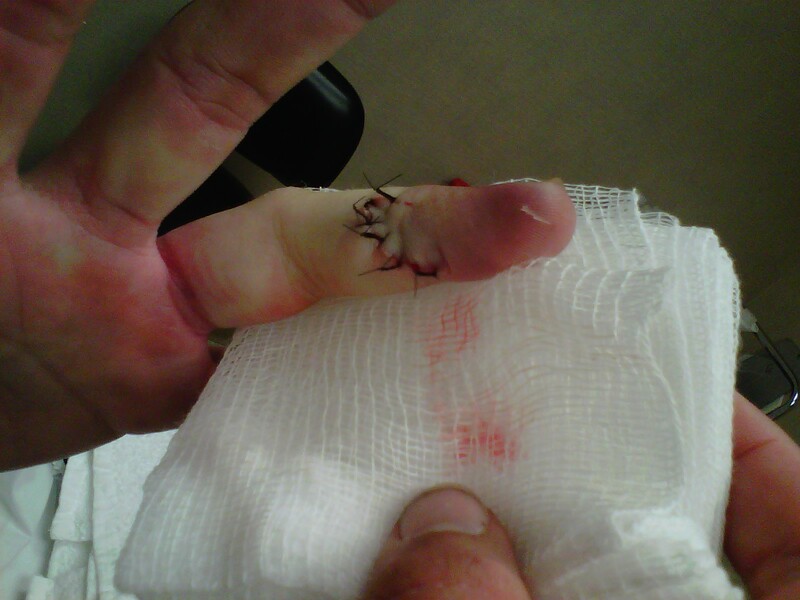 David Watson was kind enough to drop what he was doing and give me a hand. Turns out I needn't have worried as he only went about 120 yards before piling up against a tree in the bottom of the hollow. As I approached him I could tell immediately that it was the same ten pointer that Hunter and I had seen. He was a beautiful deer and a worthy opponent. This time, perseverance and a little luck had paid off for me. Chris, great video, great bucks, great doctoring, great time and great eating! Priceless family memories. Congratulations! Thanks Dean. It was definitely a day to remember. LOL on the "please say a command" Same thing happened to me the other day! Congrats on the buck, good story and and good hunt! 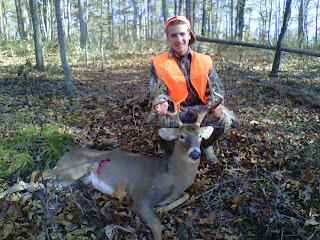 man what a good deer, do you hunt mostly hardwoods or pines, or a mix? thanks. o and is it thick where you hunt or open? Since I hunt foodsources most of the time, that means hardwoods. There's not much for deer to eat in pines. The only time I would hunt pines is if I thought the deer were using them for cover, and then, only during firearms season since it is almost impossible to predict where they will be. 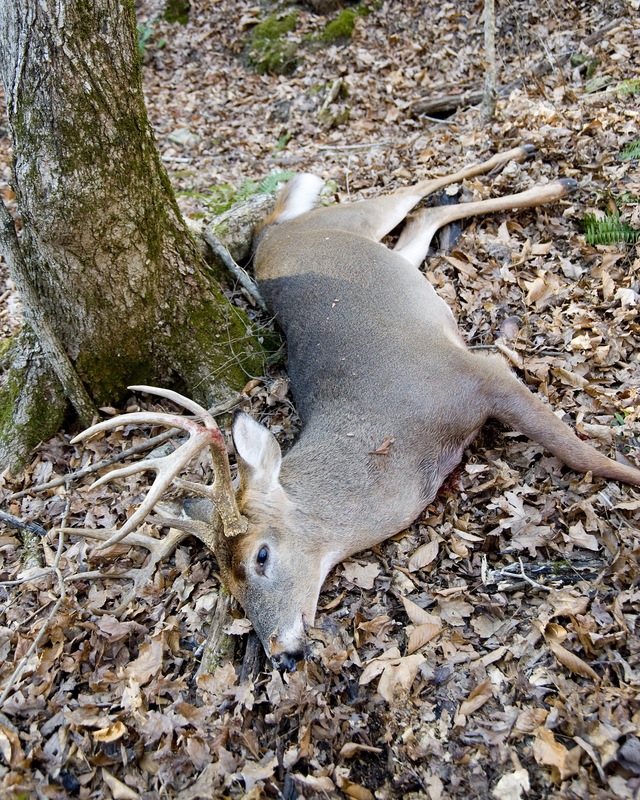 Of course, where I hunt there are lots of hardwoods, so it's an easy choice. If I hunted and area that was predominantly pines, my strategy would obviously differ. As far as thick or open, the woods you see in the video above are pretty typical. Generally the mature oaks that deer seem to prefer to feed on mean relatively open woods, since their canopy blocks out the sunshine that briers and other thick stuff need to grow. If there is thick cover nearby, that is a good thing since it tends to hold deer during the middle of the day. I try to locate dominant trees that deer will hit on their way to or from the thick stuff.